We specialize in the installation of plumbing systems. The construction of your home or building will require the work and cooperating of several different building trades. One of the systems that will need to be roughed into your home is your plumbing. You’re going to want hot water, cold water, a drain system, a sewage system and more than likely gas connections too. These are all systems that largely go unnoticed in your household because most of the work is hidden behind your walls, under your floors and in your foundation. ACTS Construction Group LLC is a full service general contractor serving Seattle WA and the surrounding area. We specialize in roughing in plumbing systems for new construction projects including the installation of sewer and septic systems. 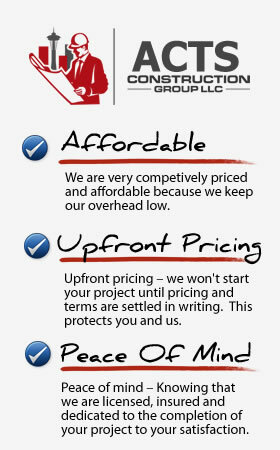 Why Choose ACTS Construction Group LLC For Your Plumbing Project in Seattle? When you choose to work the ACTS Construction Group LLC you are partnering with a team of construction professionals who have many years of experience installing plumbing systems into new construction projects throughout Seattle, WA. You can be sure your plumbing system will be installed correctly and up to building code standards so that you can have a plumbing system that will operate trouble free for many years. If you’d like to receive an estimate for your upcoming plumbing construction project please give us a call 206-503-6200 or fill out our contact form and someone will be getting right back to you.